I don’t think star photography is something I’m really going to pursue, amazing as some of the pictures I see are. I see Nikon has produced a version of the 810 specifically for the purpose, so it’s clearly a popular subject. I was having a play around in the back garden, which is not the best place, due to light pollution. 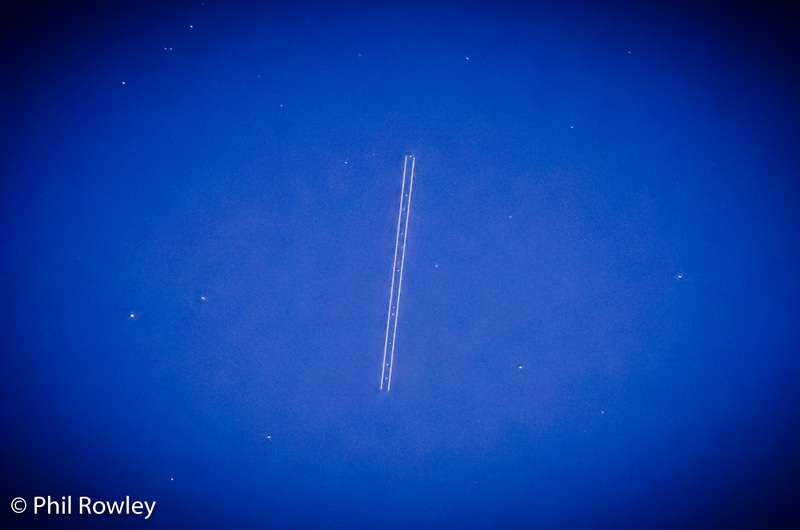 But I did find catching planes going over rather fun. Am enjoying a star gazing app but think photos will be difficult too. Yes. It’s surprising how short an exposure you need before the stars have created a line rather than a dot. I’ve seen people making devices to help them track the stars movement to avoid this. I may have another go though, when I’m somewhere darker. It’s amazingly dark where we are in Spain but valley and trees can obscure some views! Sounds like a wonderful place, from what I’ve seen on your blog. Great stuff!